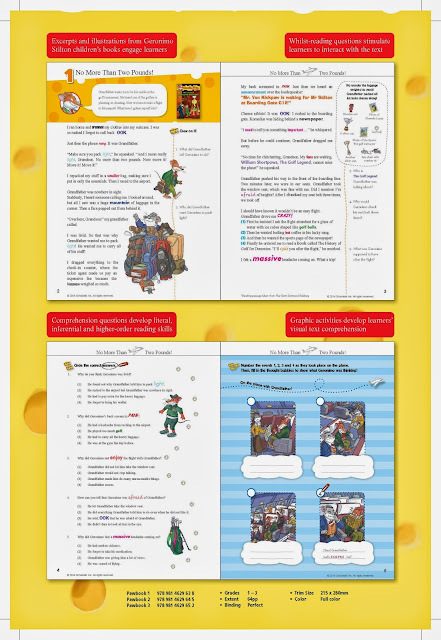 We received a set of Geronimo Stilton books that made the boy jumped with joy but shortly after he was not as keen as before. 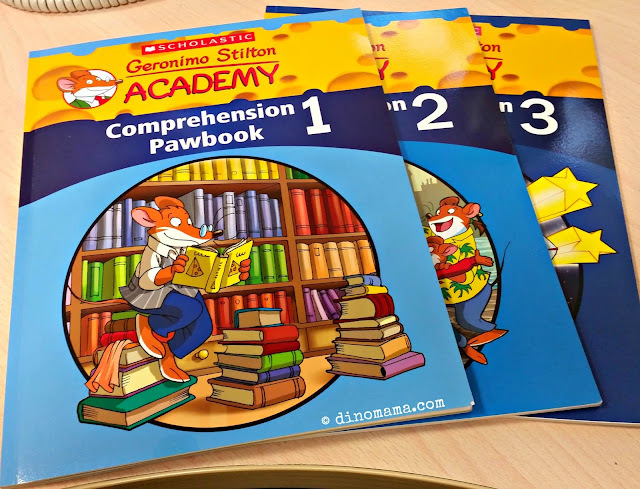 This is because he saw the word "Comprehension" on the cover of the book, he thought they were new Geronimo Stilton books but instead its an assessment book to him. I reassured him that this is not to be added to his collection of assessment books (in case you are wondering, he have less then 10 for 4 subjects), its more for leisure and of course for the purpose of this post - a book review. That made him happy again and off he went to the study room where he stayed there for about 20 mins and emerged smiling that he had finished Unit 1 - 3 plus Activity 1. 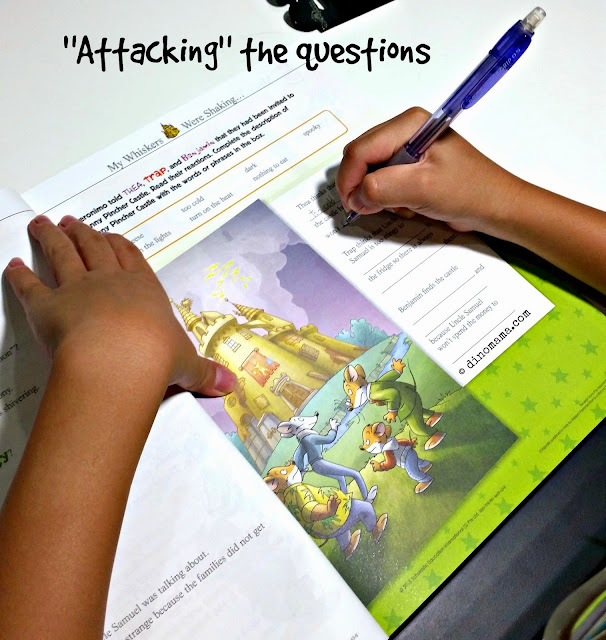 As easy as Comprehension looks and sounds like, it seems to be a challenge for some kids. The word Comprehension as the dictionary explains means "the ability to understand something" or "an exercise consisting of a previously unseen passage of text with related questions, designed to test a student's understanding". To able to understand something you must first have the interest in that particular topic/item, sad to say comprehension in school does not work this way, they do not ask each and every kids their favourite stuffs and let them read a passage about that favourite something and answer a string of questions about it. 3. read the passage again and this time underline the keywords/answers from the questions. 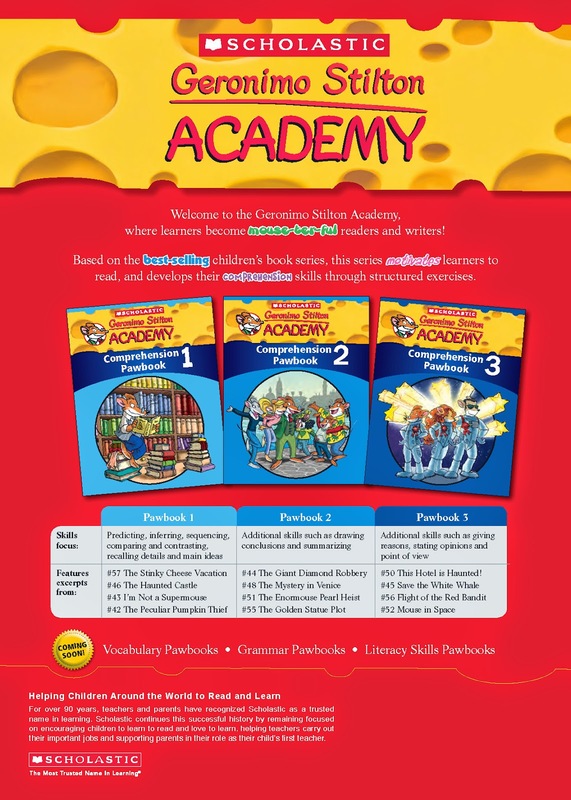 Now, I must applause Scholastic for coming with this series of Pawbook to encourage and get the kids interested in doing Comprehension. 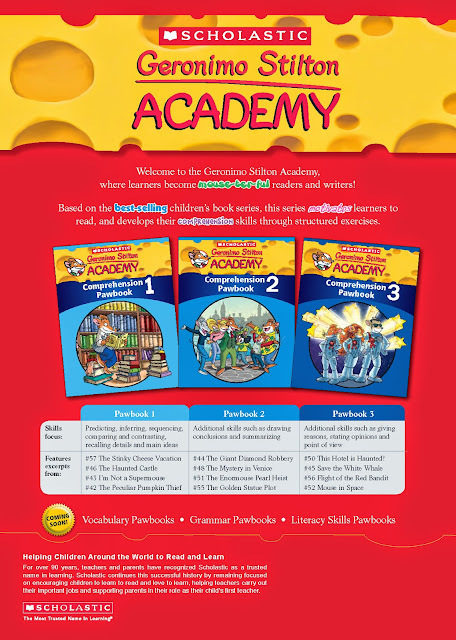 By featuring everyone's favourite new era mouse Gernonimo Stilton and in it's usual style of colorful words. it gets the kids' mind excited to do "stuffs of my favourite mouse", at least that is how DinoBoy felt. The colored and picturesque fonts not only add extra meaning to the word but also add some colors to the usual plain old black fonts. 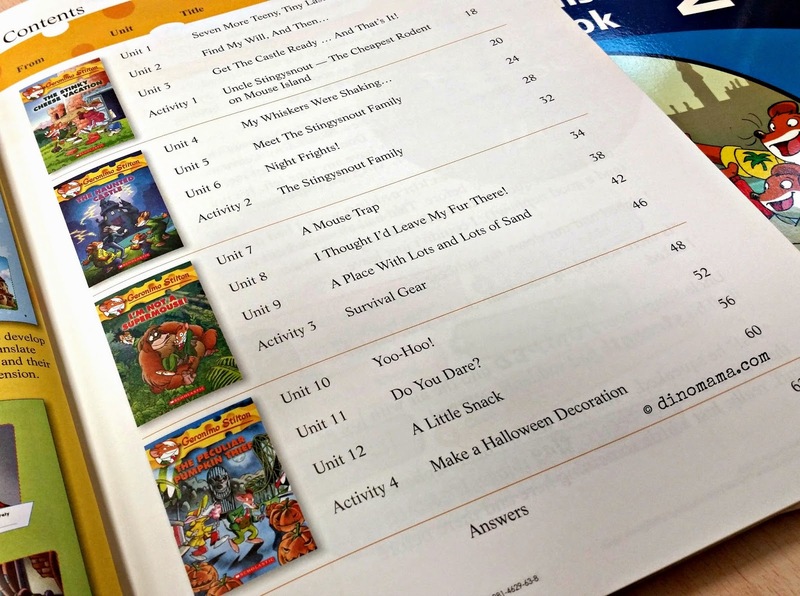 These comprehension pawbooks features excerpts from the story books and for die-hard Geronimo Stilton fans like DinoBoy, they will have a great time reading the passages and attempting the questions after that. 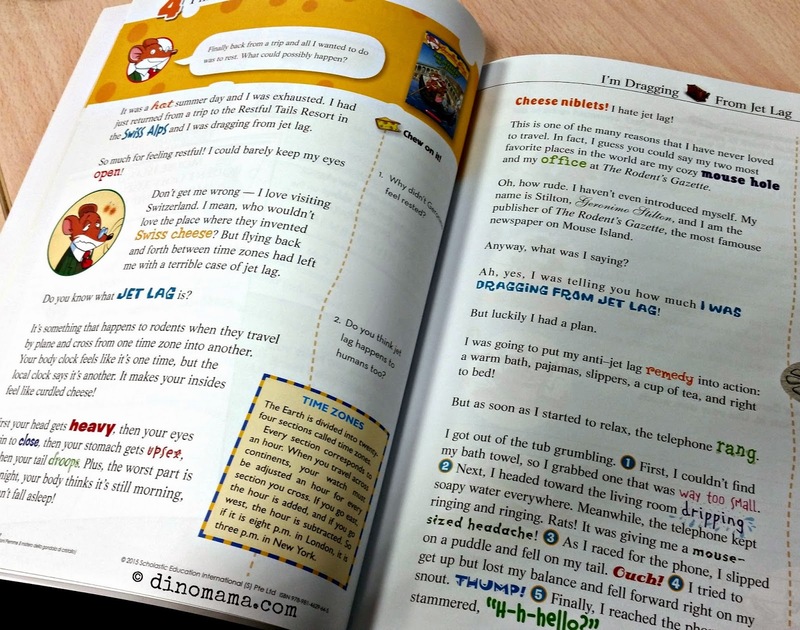 Here's a peek into what the pawbooks have to offer. 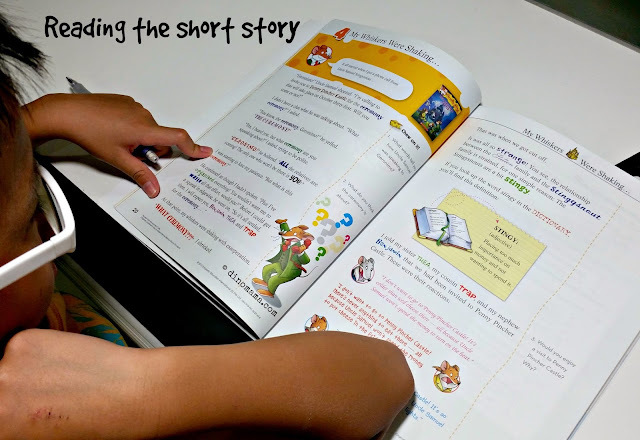 In each of the 3 pawbooks there are 12 short excerpts about 2 pages taken from 4 different books, at the end of the passage there are exercise and an activity for the kids to work on. The structured exercise for these 3 pawbooks are written accordingly to each level with easy MCQ, fill in the blanks with helping words provided for Level 1 to much difficult exercise such as summarizing, thoughts provoking questions for Level 3. Due to his busy schedule (I know right! A 9 year old's time is packed till almost the max! ), DinoBoy was only able to finish 3/4 of Pawbook Level 1. So what is his opinion of the book? From someone who is not a fan of comprehension to say that it is FUN to do the questions, I believe the books are a success already. Disclaimer : We are not affiliated to the management of Scholastics. We received a set of Geronimo Stilton Academy Comprehension Pawbooks for the purpose of this review. All opinions are based on our review of the pawbooks. All photos in this post, otherwise individually credited, are copyrighted to the DinoFamily, you may not use it without our permission.